The CodeIgniter framework MVC Concept has a relatively easy to understand. MVC concept itself aims to facilitate the division of tasks within a team. For example, the programmer handles the model and controller, while the designer takes care of the view. Let us understand the concept of MVC on CodeIgniter with a simple example in the following tutorial. 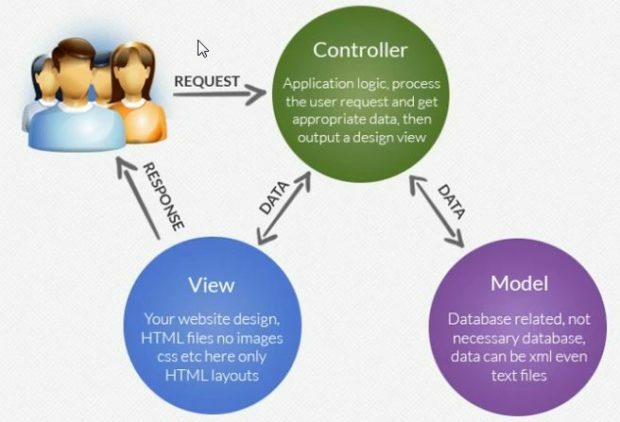 Model View Controller is a relatively familiar concept in web application development, starting with Small Talk programming language, MVC separates application development based on main components that build an application such as data manipulation, user interface, and part of application control. The Controller is a set of communication between the model and view, the controller functions to receive requests and data from the user and then determine what will be processed by the application. You can also access it in the following way http://localhost/mycodeigniter/index.php/product/index. The URI Segment is almost similar to the GET Method variable. To further understand it please refer to the following picture. To get the above results, please add the following script in the edit method. The View is the part that handles presentation logic. In a web application, this section is usually an HTML template file, which is controlled by the controller. View functions to receive and represent data to the user. This section has no direct access to the model section. Please access the following URL http://localhost/mycodeigniter/index.php/product/ and see the results. Models usually directly related to the database to manipulate data (insert, update, delete, search), handle validation from the controller section, but can not be directly linked to the view. How? To understand the MVC concept of Codeigniter is very easy right? In the next article will create a simple crud application using CodeIgniter and MySQL database. So my article about Codeigniter MVC Concept For Dummies With Simple Example may be useful.